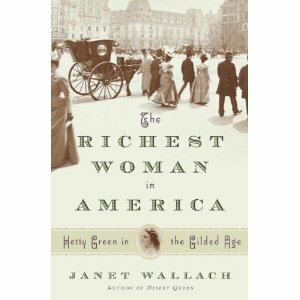 Janet Wallach's The Richest Woman in America: Hetty Green in the Gilded Age is ostensibly about Hetty Green, a woman who inherited a lot of money, sued a lot of people for even more money, and died even richer than she was originally because she was a very shrewd investor. She sounds like a really feisty and interesting woman, but unfortunately, Wallach doesn't seem to have had much information about Hetty herself. The book is very general in tone. Green was a very private woman, and she wasn't particularly well-liked by her peers. She wanted women to have access to greater education, but she did not support women's suffrage. She hated lawyers, but she loved suing everyone. She used her money to stabilize the financial system and lent money to New York and Chicago, but she also could hold a deep grudge and made sure that those she disliked were punished. It would have been really, really great to get some insight into her character. But Green left no diaries. She didn't share anything very deep in her interviews. There is no depth to her in this book. We see her go through the motions of her life and defend what she considered to be her own, but we get no read on her truly complex personality. For someone who was so rich, she seemed terrified of being left poor and alone and spent very little money. She didn't get along well with anyone in her family. She was controlling and paranoid. But she was also brilliant. And, for me, Wallach failed to bring that complexity to life and make Green a 3-dimensional person. Instead, the richest woman in America seemed flat, stingy, and paranoid. The book provides a picture of the financial markets in the Gilded Age, which I enjoyed because I don't know much about that era at all. But the book did not provide any great detail or insights into a woman who succeeded so brilliantly in a man's world, and that's what I wanted. Note: This review is based on an advance reader's copy. I received this book for free to review. The title sounds a bit misleading, I would expect lots of information about Hetty too. I enjoyed Charles Slack's HETTY: The Genius and Madness of America's First Female Tycoon pub'd in 2004 - I read it because she was from New Bedford MA, not far from me. I only recall how horribly unhappy she seemed - why be wealthy if you don't enjoy it? For me, it would be so see how I could set it up to give and make a major positive influence on the world. She left no longterm dynasty (I am always curious abt what the next gen does with their inheritance) or did she gave it all away? I don't remember. Also, I have met Warren Buffet and I am sure he is a nicer person that this sad shrewd lady. I think that we're about to see even more books like this because all of the big historical names have been written about so many times. Yes there are plenty of other interesting historical peeps but there is probably not enough information out there to write about most of them. That's why I appreciated Lois Leveen's Mary Bowser book. There isn't much out there about Mary but it sure was fun to imagine things that she could have done based on what we do know! hmm I kind of remember reading about her in the reading comprehension books I used with my students. The only anecdote I remember is that she didn't want to pay for a doctor and her son ended up losing his leg or something. I think it's the same person? It reminded me of how this woman used to attend my church growing up--she looked like she could be homeless we all thought she was quite poor, but when she passed away she left a lot of money to the church. It stunned us! Anyway I'd read a whole book about her but this doesn't sound like one I'd enjoy. I think I would be disappointed in this biography too, as I'd expect more personal information about Hetty Green. But I guess, with her being such a private person, there was no way to get an insight / memories from her direct family. Pity! Most of this book sounds kinda like...What's the point? If you don't paint a clear enough picture of the person to where they feel impactful, or you don't cover how this one person represented something much larger in scale in society or history...what is the point of writing a book about him or her? It sounds like it intended to do these things but maybe failed.